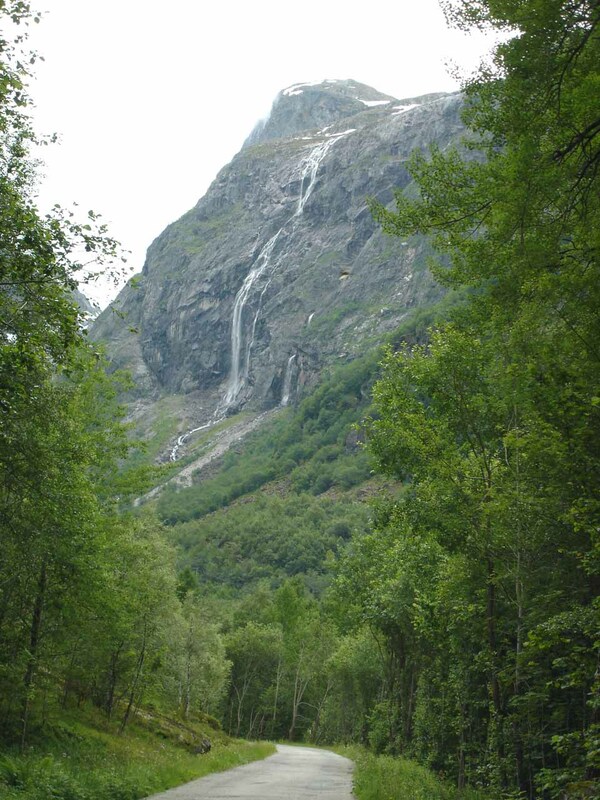 Kyrfossen was one of those waterfalls that Julie and I accidentally stumbled upon when we decided to drive to Osafjorden and the town of Osa on a whim. 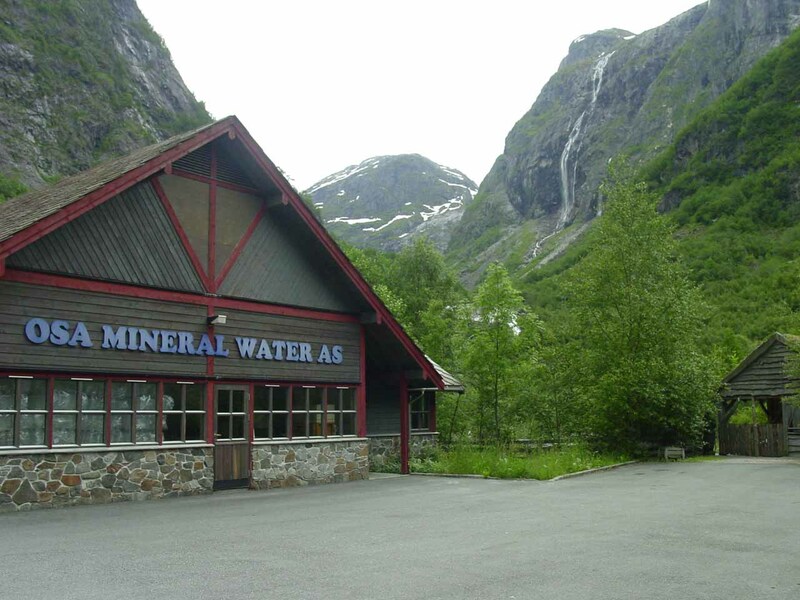 I didn’t recall exactly what compelled us to do this, because it very well could have been a factor as to why we missed the real Espelandsfossen in Granvin in our haste to get to Voss from Eidfjord after this detour. 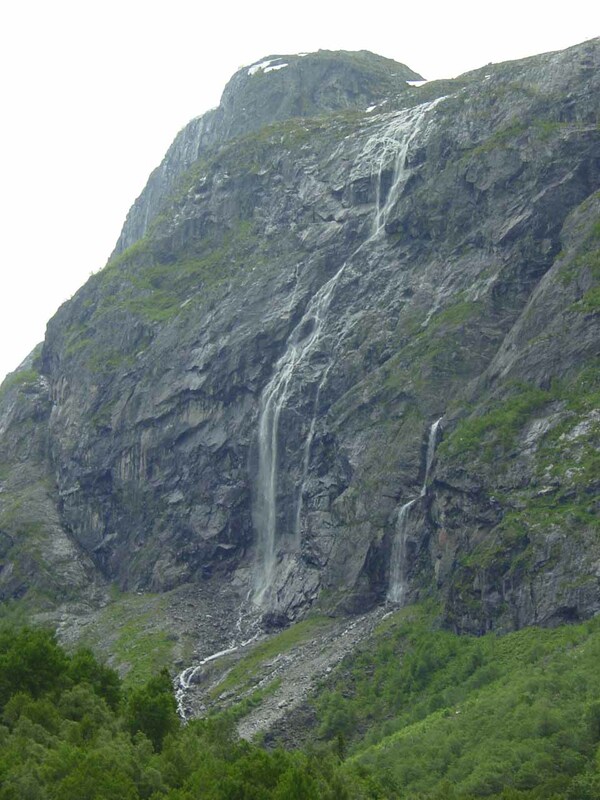 That said, when we first visited this place, we noticed this very impressively tall waterfall (said to be 450m tall with its highest drop at 360m) but didn’t know its name or its true watercourse. 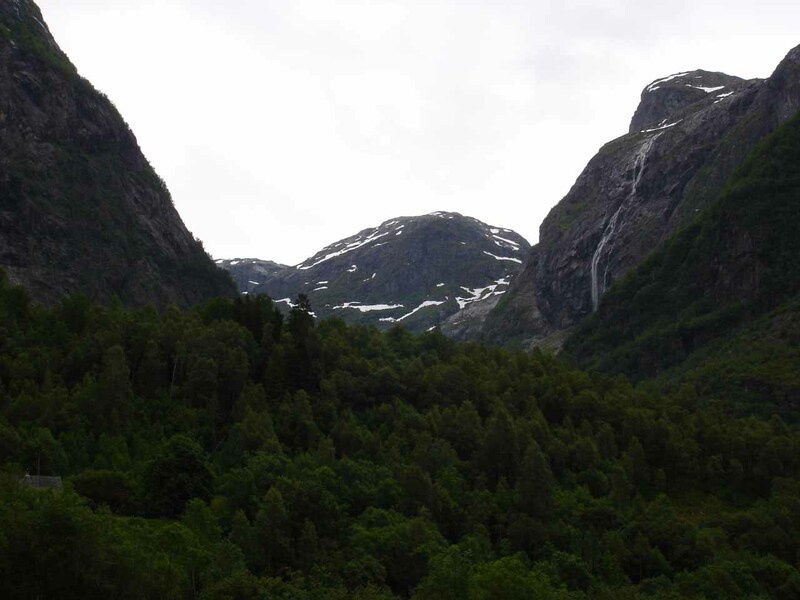 In fact, many of the other waterfalls we noticed during this Osafjorden detour seemed to be obscure miscellaneous waterfalls and didn’t seem to attract any special attention from us until many years after the fact when we finally were able to correlate our photos with the updated Norgeskart (formerly Norgesglasset). 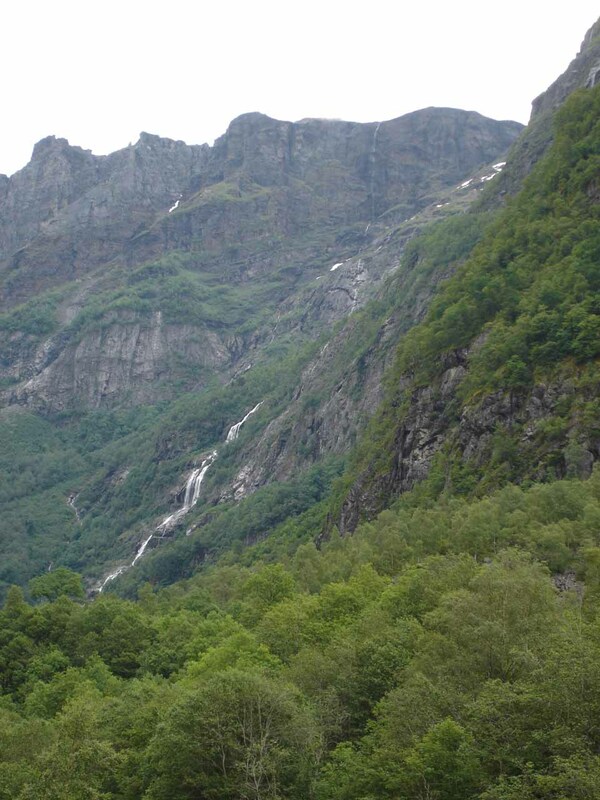 Nonetheless, we managed to identify the waterfall at the top of this page as as the one flowing on the Kyrelvi stream and thus went with the unofficial name of “Kyrfossen” (Cows Falls?). 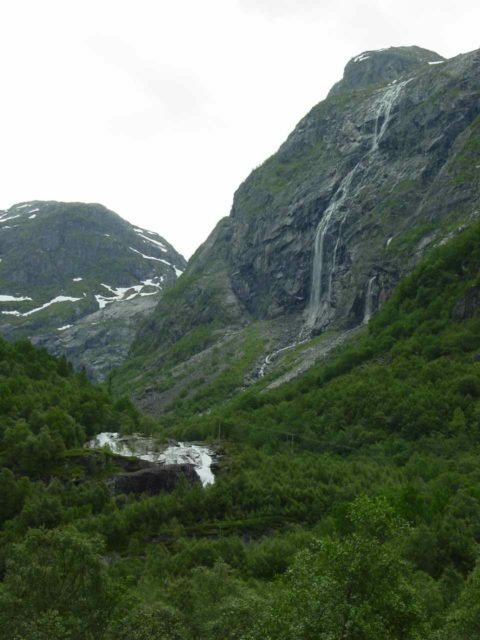 I’ve also included on this page the other Osafjorden Waterfalls since Kyrfossen alone wouldn’t be reason enough to make the detour. 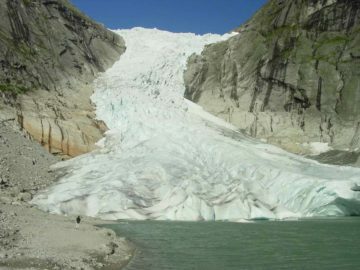 However, the overall collective of the Osafjorden Waterfalls we encountered during this detour certainly compelled us to remember and write more about them, spearheaded by the conspicuous presence of Kyrfossen. 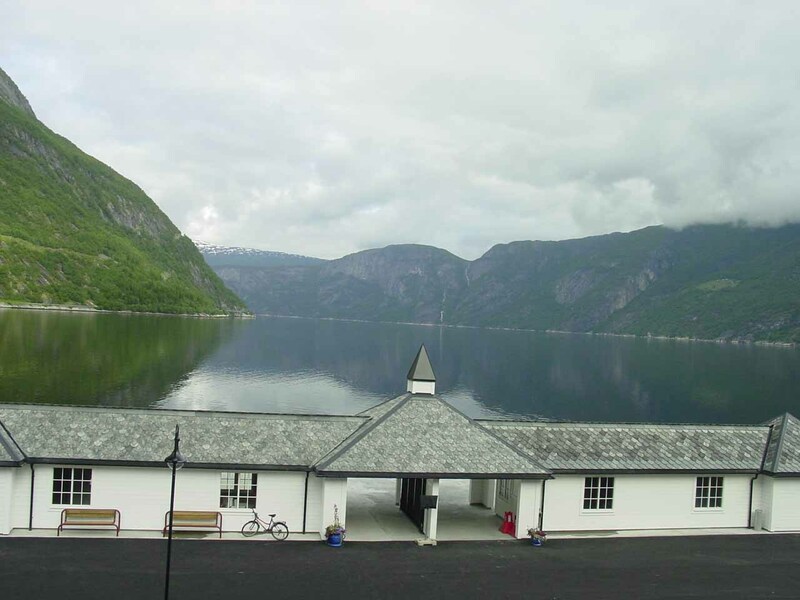 Speaking of Osa, it seemed to Julie and I to be a quiet rural community near Ulvik. 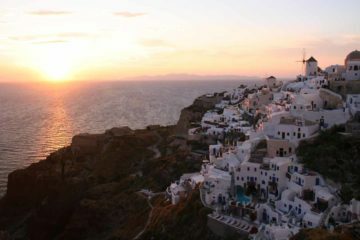 It definitely didn’t seem like it was the kind of place tourists would go to. It turned out that our visit pretty much involved a scenic drive here on a narrow county road along the fjord. 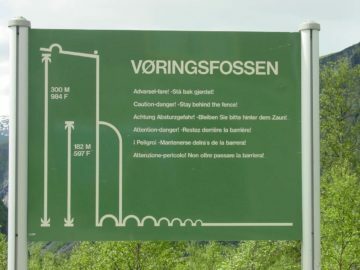 We ultimately turned around at the Osa Mineral Water AS building, but behind the building, it seemed like there was a gushing waterfall on the main watercourse of Austdølo called Røykjafossen. We wouldn’t get any clean looks at it other than the partial views you see on this page. 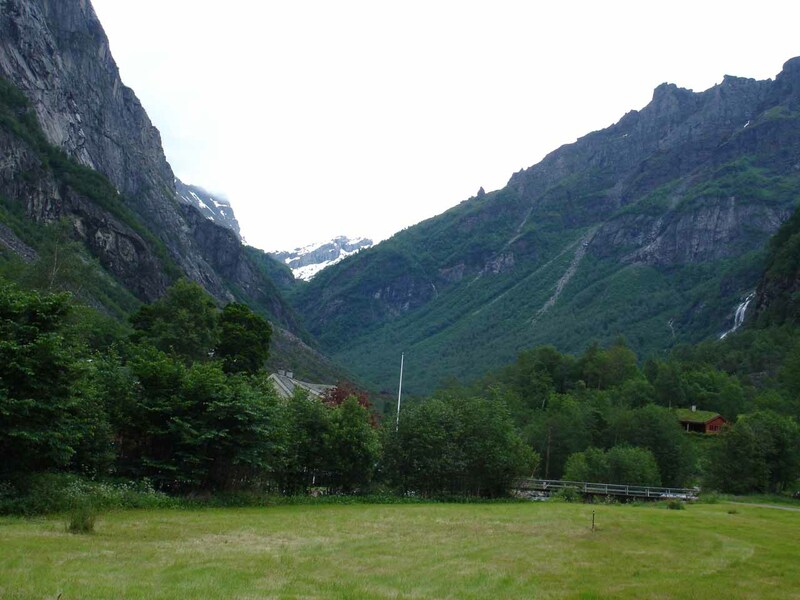 In addition, we also were surprised by the scenic U-shaped contours of two valleys converging at Osa. At the base of both of those valleys were the watercourses Norddøla (North Stream?) and the aforementioned Austdøla (East Stream?). 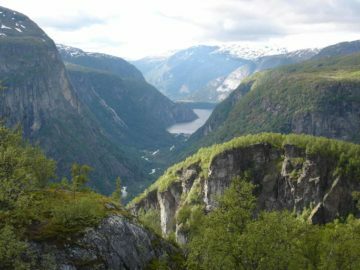 Kyrfossen resides in the Ulvik Municipality. For information or inquiries about the area as well as current conditions, visit their website or Facebook page. 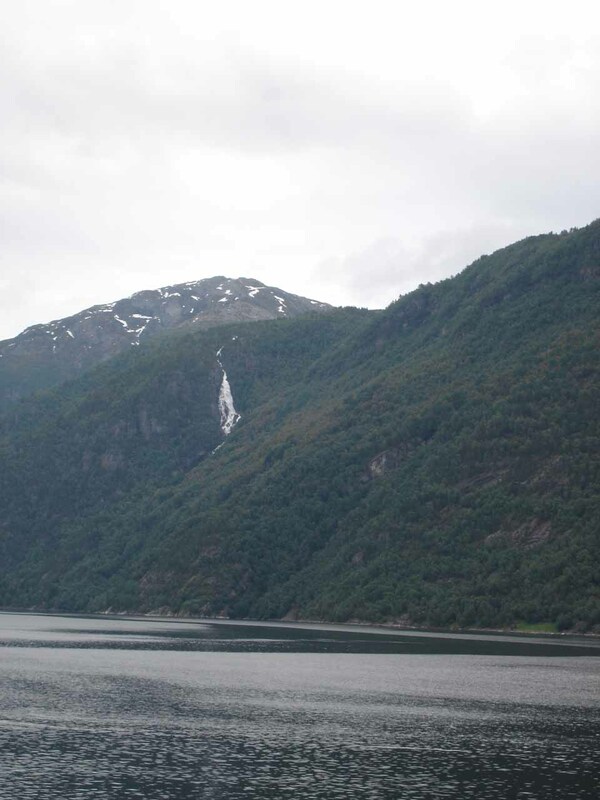 From Eidfjord, we went west on Rv13 towards the ferry. After crossing the ferry across Eidfjorden, we then followed the Rv572 (to the right) for another 10km towards the town of Ulvik. 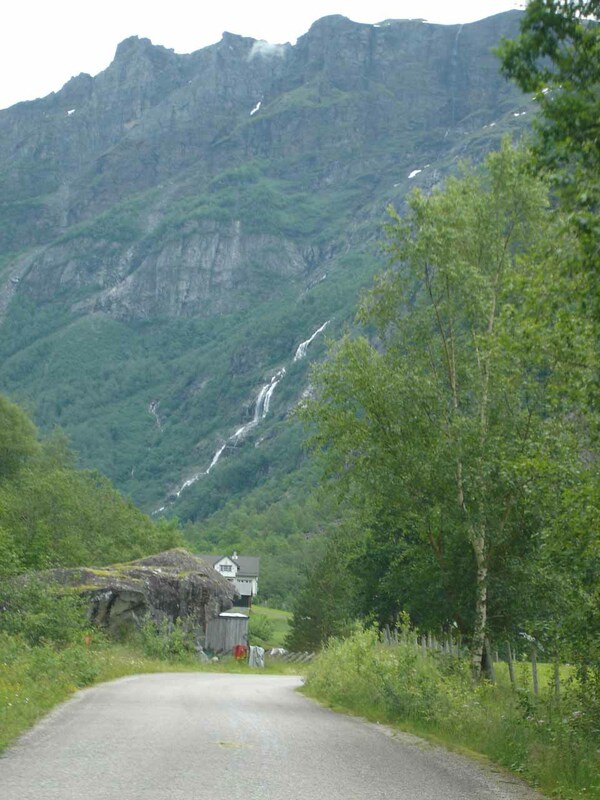 While in the steep town, just before the Rv572 made a steep turn further uphill, we got off the main road at Tyssevikvegen, and then we then continued straight ahead on this narrow county road (becoming Road 300) for another 10km towards the village of Osa. 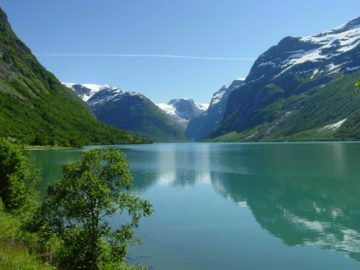 This was the other broad valley we saw at Osa. 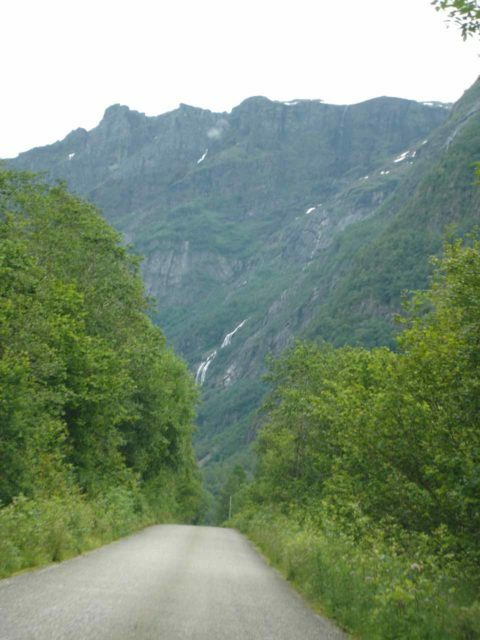 I believe the stream through this was Austdøla (East Creek?). 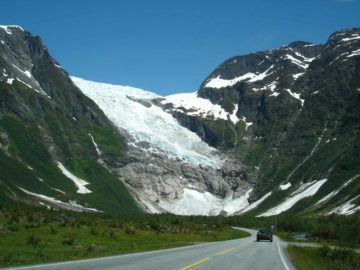 Notice Kyrfossen on the topright.